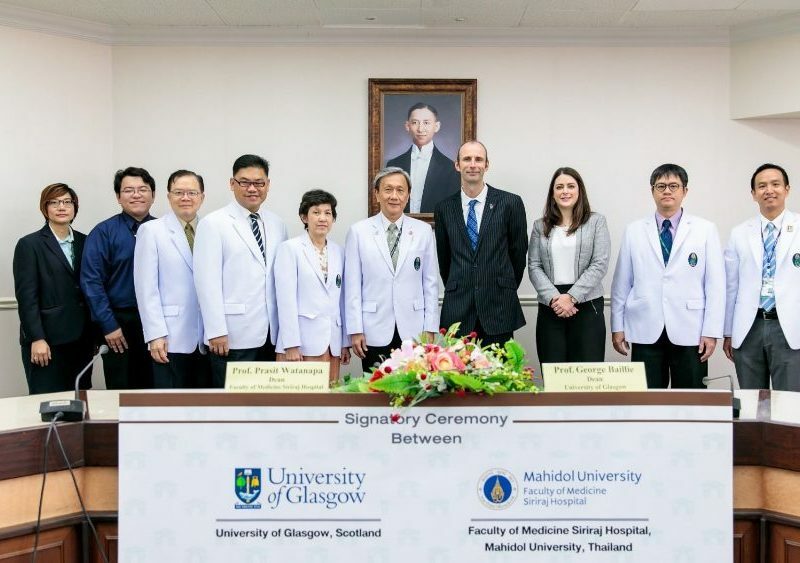 Mahidol University by Faculty of Medicine Siriraj Hospital, signed a historic agreement with the College of Medical, Veterinary and Life Sciences (MVLS), University of Glasgow, Scotland, United Kingdom to commence a joint PhD programme, as the first ever International Joint PhD program. 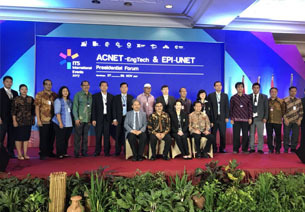 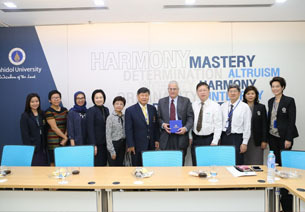 The agreement was fostered by the earlier signing of an MoU brokered by Professor Dame Anna Dominiczak, Vice-Principal and Head of the College of MVLS, and Professor Frank Coton, Vice Principal and International Dean for South East Asia, University of Glasgow. 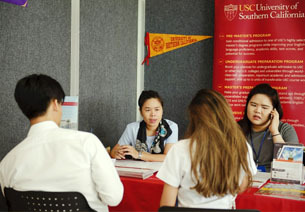 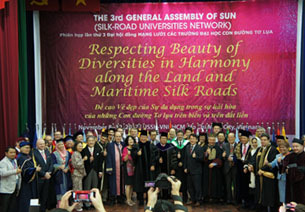 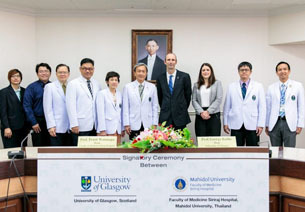 The deal was signed for the College by Professor George Baillie, Professor of Molecular Pharmacology, Institute of Cardiovascular and Medical Sciences, and Dean of Graduate Studies, MVLS College Senior Management, University of Glasgow, who, in conjunction with colleagues from the Academic Collaborations Office and External Relations, negotiated the deal with representatives from Mahidol University. 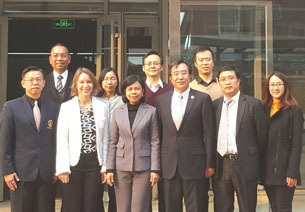 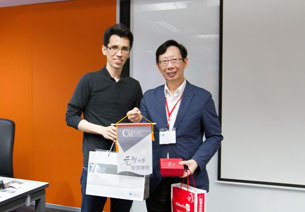 The agreement will support a two-way exchange of PhD students, supported by joint supervisory teams at both institutes, with students obtaining a single joint degree but graduating at both institutions. 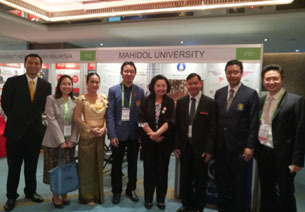 Professor Baillie visited Mahidol University in November to participate in a signing ceremony for the Joint PhD programme. 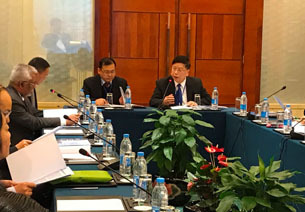 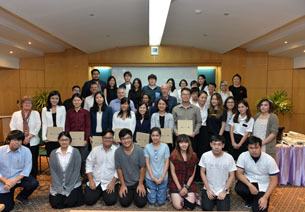 Professor Prasit Watanapa, M.D., Dean of Faculty of Medicine Siriraj Hospital has identified the first group of PhD students from Laos, Myanmar and Thailand. 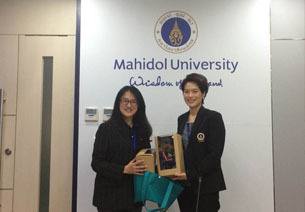 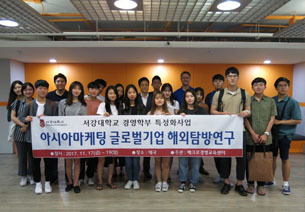 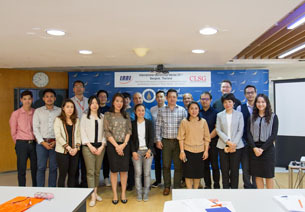 The students will participate in the programme and become future staff at Mahidol University. 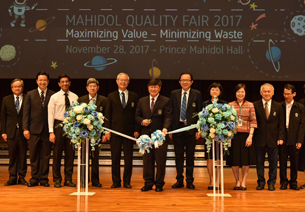 Mahidol University has a new unit to manage research excellence. 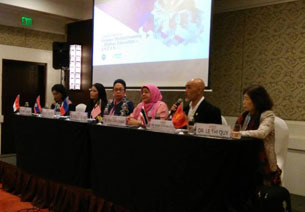 It has identified three key research areas: infectious disease (particularly dengue and antimicrobial resistance); cancer (immunotherapy, precision medicine, system pharmacology, breast, rectal, brain and pancreatic cancers) and immunology. 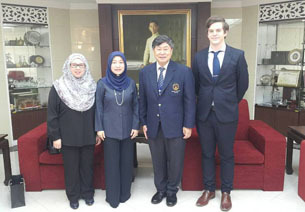 These three areas will be the initial focus of the Joint PhD programme. 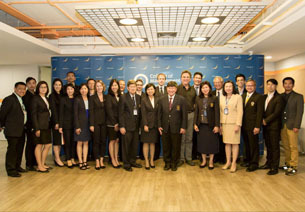 However, in time the programme will cover: regenerative medicine; clinical research and big data.